It will take a lot of money to topple the $100 billion lighting industry—and many CEOs. Bill Watkins is moving aside as CEO of LED startup Bridgelux to be replaced by Bradley J. Bullington. Watkins will become Chairman of the Board of Directors. According to Bridgelux's PR firm, Watkins "made this move on his own accord." Bullington moves up to CEO from his current post as VP, Strategy and Corporate Development and GM, Technology Solutions. Watkins had been CEO since January 2010. Both Watkins and Bullington worked at disk drive builder Seagate in previous lives, Watkins as CEO from 2004 to 2009. According to then-CEO Watkins in an earlier interview, Bridgelux generated $32 million in revenue in 2010 and hit about $80 million in 2011. Bridgelux is north of the $225-million-of-VC-invested mark. But going after the $100 billion lighting market is not for the weak of heart -- or wallet. Funding has come from VantagePoint Capital Partners, DCM, El Dorado Ventures, Novus Energy Partners, IFA, Chrysalix, Harris & Harris Group, Craton Equity Partners, Jebsen Asset Management, Kaistar Lighting, Passport Capital, et al. 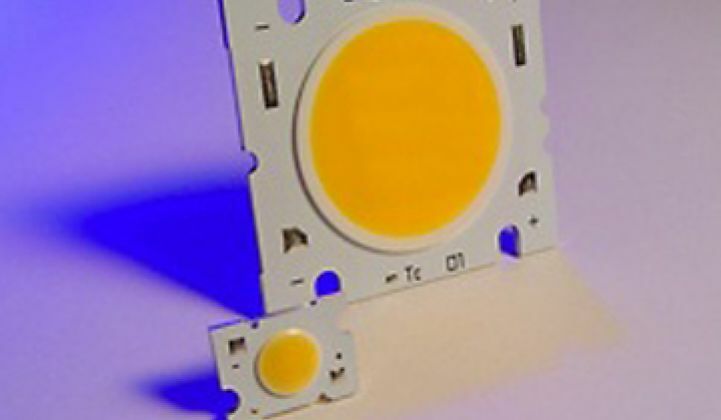 The revenue at Bridgelux is encouraging, although the message from the firm has been fluid over the years -- from building factories in the U.S., moving from four-inch sapphire substrates to eight-inch silicon substrates, being active in the LED streetlight market, innovating in packaging and phosphors. At times, the firm seemed spread thin. With revenue near $100 million, why hasn't the firm risked the public markets? The lighting market is enormous and in transition. The shift to LEDs in general illumination is happening, but the technology still needs to improve in efficiency and color-rendering to reach mass consumer markets. LEDs are initially entering the lighting market in commercial and industrial applications where the payback calculation is already compelling. Groom Energy and GTM Research predict that the LED enterprise lighting market will surpass $1 billion in annual revenue by 2014. LED fixture prices have fallen 24 percent in the past two years, and the prices will continue to come down. LEDs consume about one-tenth the power of incandescent bulbs and about half of the power of CFLs. LEDs can last 50,000 hours and incandescent bulbs are slowly being outlawed across the globe. Lighting accounts for 22 percent of the electric power in the U.S. and 35 percent in California. There are immense business opportunities along the lighting value chain, and there is intense competition at the chip and package level (Osram, Philips, Toshiba, Cree, Bridgelux), the bulb level (Philips, General Electric, Sylvania, Lighting Science Group, Switch, Soraa, LEDnovation, Lemnis, LEDwiser) and at the fixture or networked lighting layer (Daintree Networks, Redwood Systems, EnLighten, Lunera, Digital Lumens).